Rumors of a amphibious-like man living in the swamps east of the Western Massachusetts town of Killville have persisted since before the turn of the 20th century. Fisherman have claimed that a "Frogman" has swam up and stolen their fish right off of the line. Other witnesses are said to have observed it sitting on the banks of the Manhan river catching insects with a tongue they describe as over a foot in length. It has been frequently blamed for chicken stealing and making the occasional meal of entire litters of farm kittens. In 1932 farm hand Fenton "Blinky" Farnsworth was sent to the electric chair for the abduction and murder of his boss's 4 year old son Danny Howard. Farnsworth swore he had seen a giant frogman carry the boy into the woods. Though many locals believed Farnsworth's story and testified on his behalf, the Commonwealth of Massachusetts chose scientific fact over local folklore and executed Blinky on October 17th 1932. The body of little Danny Howard was never found. There had never been any concrete evidence except for the occasional unidentifiable muddy webbed foot print until Cyrus Clark snapped the only known photograph (left) of the creature in September of 1971 back in Miller's swamp by the old ruins of the killer's house. At least it's believed that Cyrus Clark took the photograph. Poor old Cyrus Clark never returned from the swamp that day. They found his camera his canoe and one of his boots way back in Miller's swamp. Folks say he might've just run off, after all, everyone knew that living with Eunice Clark was no picnic. But who would run off wearing just one boot? The jury remains out on the authenticity of his photograph. When shown the picture, University of Massachusetts zoologist Dr. Charles M. Byron stated, "I don't know what the Hell this thing is. If it's real it would be the find of the century. We would have to rethink everything we now believe about evolution." Missing link? Hoax? Rural Legend? Maybe those fishermen are just telling stories as fisherman often do. Maybe those chickens are being eaten by foxes and coyotes or perhaps just running off. Maybe Blinky Farnsworth was just your run of the mill baby killer. Who can say? 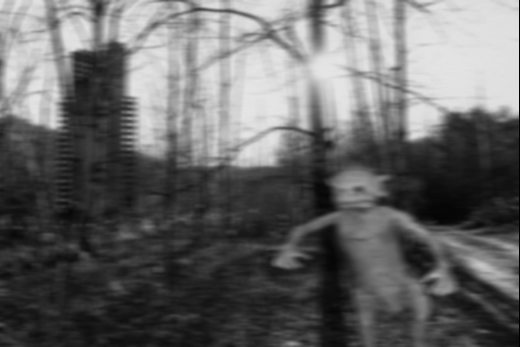 Is the only known photograph of Toady real? If only we could ask old Cyrus Clark, but he ain't talking.